Recently the people at Turtle Wax sent us a great little care package which included their line up of brand new Turtle Wax ICE products. I'll be honest in telling you that the implication was that I write up an article candidly discussing the products, but that said I'm very happy to report that my experiences with this product line has been pretty good! Also, as much as I love the feel of a clean car I'm really not all that much of an auto detailing hobbyist... Your mileage may vary! 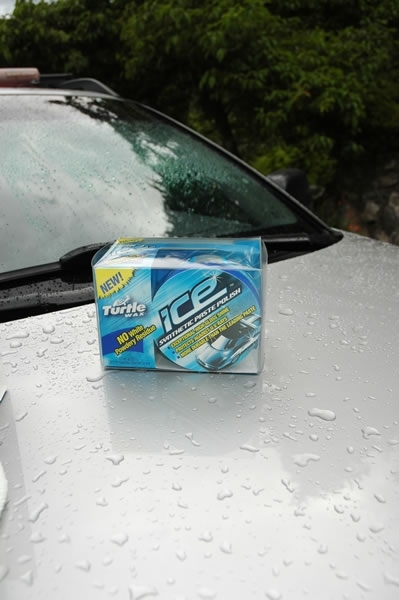 The flagship product of this new lineup is the Turtle Wax ICE Synthetic Paste Polish, an exciting new paste polish with a number of key benefits which we'll discuss shortly. To accompany this new product, Turtle Wax built up a complete lineup of products to accompany the paste, including a liquid polish, spray detailer, car wash soap and liquid clay bar. Though we didn't receive the liquid polish nor the spray detailer, we instead received a set of microfibre towels, and their Foam Away 1-Step Wash and Wax. Nothing much to report here, pretty much your standard car wash soap. Our water here in Vancouver is pretty soft so I'll have to take their word for the fact that it does a good job at minimizing water spots. Aside from that, I guess it smells nice? The microfibre towels are also pretty much your standard microfibre towel. Guess the only thing I could say here is I particularly appreciated the sentiment as it was just about time for me to replace my set... So thanks for that! This stuff is interesting. I wouldn't say it's quite as effect as detailing with a true clay bar, but it seems to work a lot better than most of the liquid paint cleaners I've used. It's also really quite a nice product to work with... It feels as though you're working with a mild cleaner (not too much effort required) but with the effectiveness of a heavy duty paint cleaner. I had some pretty nasty oxidation going on with my tailgate and for the most part this stuff took care of the problem. This product is one of my two favorites here. It's convenient, effective, and when the time comes when I have to buy a replacement bottle, the cost ain't all that bad when compared to some of the more boutique oriented product brands. Contrary to a traditional paste, the Turtle Wax ICE Synthetic Pasts Polish is a pleasure to work with and with one HUGE advantage... Turtle Wax actually encourages you to cover ALL surfaces of the vehicle, including rubber mouldings and all plastics. That's right, no more white marks on the XC's plastic cladding! After a single application, I'd say the results on shine are good. I wouldn't say it's as smooth as something like a Meguiar's Techwax, but considering the fact that there's no need to be careful around the plastic cladding, I'm more than willing to put up with a slightly lesser shine resulting from this product. Another nice benefit here is the fact that the paste can be applied in direct sunlight. Probably not a big deal for those of you with covered garage spaces but out here at the home office of VolvoXC.com our V70XC lives outdoors 24x7, and trying to find time to wax the car in the shade is quite the challenge. I'll be restocking with this product when the time comes, that is until something else better comes along! 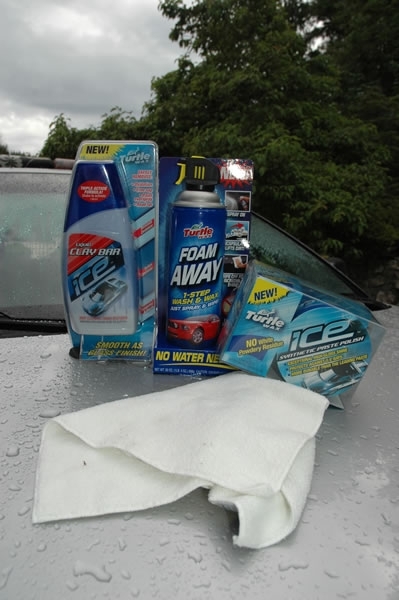 You don't even need a hose to wash your car with this product, just spray on the vehicle and wipe off. Nice marketese, but does it really work? I tested it out and was reasonably impressed. The packaging mentions the contents are enough to wash up to five cars, but I used it just once and am pretty sure I used about 2/3rds of the can. I admit I probably used far too much... The packaging says to apply a thin coat of foam, but I wasn't all that comfortable wiping my car's paint with such a small amount of foam, so most likely went way overboard. Your mileage may vary! This would be a fine product for someone who hasn't got access to a hose like an urban apartment dweller, if you're on the road and can't find a car wash, or maybe just for a quick touch to clean up a bird bomb or small mess. All said, I found the Liquid Clay Bar and Synthetic Paste Polish to be good products and especially nice considering I no longer need to be careful around the cladding. Foam Away? I'll pass but probably useful to a few niche markets and situations. Car Wash and the Microfibre Towels? Neither here nor there.. These are commodity products so kinda tough to give a big opinion one way or another but can't really say anything bad about them. Hope that helps, and by all means, please feel free to discuss this article in the forums! I read some very good reviews on Turtle Wax Ice. I tried Ice wax on my 2010 TSX. The polish went on easy, but was a bear to get off; it was like removing elmer’s glue from my car. I wonder if I put the wax on too thick. What was your experience with removing the wax.